“A basement with the view of a loft” 30/11/2015 www.efsyn.gr How magical can Monday nights become, with a fresh girl waiting to sing to you a cappella, with her charismatic voice, wonderful songs and to recite lyrics of great poets! There, in a neighborhood of Kipseli, with the once appealing apartment buildings, where an apartment, with heating and hot water was the dream of the newly arrived people of the Greek provinces. Apartments which embraced the dream of a better and more comfortable life. Apartment buildings – witnesses of the class distinctions, the highest being the top floor and then rolling down to the basement, full of…petrol fumes from the burner. Now, these apartment buildings, most of them, have been abandoned to time’s ruthless decay, with their common spaces looking like victims of the economic crisis, with empty burners, and with empty rings on the entrance staircases, which in the past used to hold the gold-plated bars which in turn kept the (preferably) red carpet of the entrance in place. So, there, in the suffocating Cyprus Street, art is breathing, at the KET - Television Control Center (http://polychorosket.gr/). Every Monday (until 28th December) Christina Maxouri, stuck in “Borrowed Shoes”, awaits to show us with pride her own decorated basement, with two benches where she has placed her companions on this “handmade performance” – her clarinet, her falsetto baglamadaki2, her glockenspiel… She has hung pictures from her childhood on the wall, on the base of the bench there are neatly placed books and further away there is an umbrella made by palm tree leaves waiting to be opened by “Les pêcheurs de perles”. “Let your little hand” she sings to us as she greets us. And we let ourselves be swept by her wonderful performance of old and new melodies, which she stops every now and then, takes one of her favorite books and reads Hadjidakis, Elitis, Peresiadis, Shakespeare. And then resumes her singing. She calls two friends of hers, Fotis Siotas and Sofia Efkleidou, the first with his violin, the other with her cello, for a small melodic conversation with them, as if tripping up the a cappella, and then again she sings alone. There are many moments that you want to sing too, but you only move your lips so that you don’t cover even for a moment Christina’s tinkling voice. She is really sensational in the song by Gaetano Veloso “Cucurrucucu Paloma”. You want to hug her when she cleans her dress because she had sat on the floor for a while playing her glockenspiel, you want to caress her head when she makes little voices of despair with her baglamadaki. When she makes mistakes she surpasses them unconcerned like a child, when she succeeds she is embarrassed by the applause. Because behind the innocent, youthful face, with the shy smile and the expressive eyes, there is a fully consistent and professional artist. 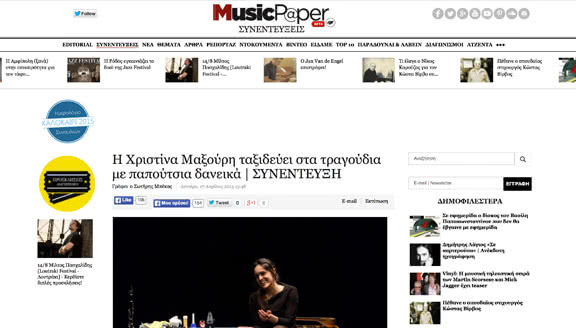 She is a distinguished graduate of the “Neo Elliniko Theatro” College of Drama of Giorgos Armenis. She is Christina Maxouri and is expecting us every Monday. And reservations need to be made because the venue is spaciously small, in a basement with the view of a loft. 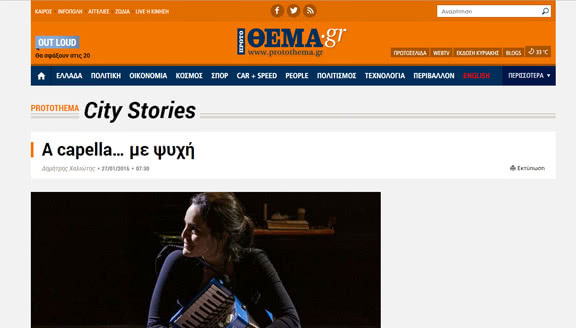 “Borrowed Shoes in dedications, in letters, in our allegories…” 29/11/2015 www.e-tetradio.gr Christina Maxouri walks again in her “Borrowed Shoes” in KET (Television Control Center), for the second year. After many travels, many collaborations and most definitely many readings (! ), she returns with an even more dynamic and mature performance, with her own personal signature. We all often wear Borrowed Shoes. In dedications, in letters, in everyday life, in speech, in our allegories. And Christina takes us on a journey back to the world of creation where everything can be connected and make different sounds and images. In an atmosphere especially familiar – it is frankly as if we are guests at a poetry reading in her personal space – Christina Maxouri unites poetry, melody and theatre with dreams, hopes and a contemplation of the world through an artistic point of view. Elitis’ lyrics, a letter from Korea, a palm tree a la francais, the little baglamadaki playing “bang, bang my baby shot me down” and memories from journeys. In this walk through melody, the writing lines of all kinds, but also the necessary silence, she is accompanied by Fotis Siotas and Sofia Efkleidou. The performance takes place in KET, every Monday. Do not miss it! “Nights by acclamation…” 12/11/2015 vassilisrouvalis.blogspot.gr The performance of the a cappella songs that Christina Maxouri chooses for the nights of “Borrowed Shoes” at the KET (Television Control Center), creates the beneficial illusion of a dismissal of the current space and time… Through her monophonic imprinting of the lyrics and the melody she forms a special calling to bygone nights – where the unification of the initiated to the musical entertainment consists of the simplicity of emotion as well as its intensity, as opposed to the contemporary formalism in the connection between the transmitter and the receiver without fervor, without osmosis or the sense of a communal feeling. This special actress’ musical performance is based on three basic facts: the call to the spectator – listener to participate as a result of the directness of her stage presence, the endeavor to make present again the centuries old musical tradition of singing without the accompaniment of musical instruments (which is almost completely forgotten), but also, in conclusion, the recognition of diversity in the contemporary approach of musical fields more or less registered stereotypically in the wider audience of music lovers. Whoever finds themselves in the small venue of the KET, will have the chance to enjoy a banquet of benchmarks of the Greek music (contemporary, folk, traditional), as well as a wider range of Maxouris’ personal favorites from French music and movie soundtracks (from Tony Maroudas to Manos Hadjidakis, Gaetano Veloso and Nancy Sinatra). At times, in parts of the performance, her voice is accompanied by a violin (Fotis Siotas) and a cello (Sofia Efkleidou), as well as a glockenspiel, a baglamas, the Epirian clarinet, like small sound brushes which are deemed necessary to highlight her craftsmanship and her subtle approach to this original and authentic concert experience. 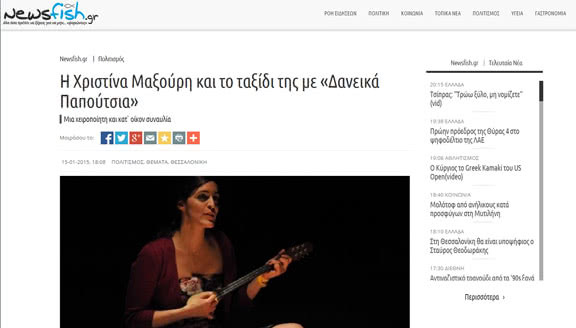 A cappella….soulfully 27/1/2015 www.protothema.gr Christina Maxouri with no program or music scores, alone on stage 29 November 2013. “Borrowed Shoes” embark on their journey at Harvest, one of the most beautiful bars of Athens. Christina Maxouri welcomes us with her ever-shining smile and her resounding laugh. It is her night. The opening of the most personal project of her career. Alone, only a breath away from all of us, she will take us on a journey with her Doric voice. A cappella. With songs we have loved. As simply and essentially as that. In a few minutes we have all become one. Christina achieved that. A year and a bit after that, Christina wears her “Borrowed Shoes” and travels through Greece and abroad. Already Ptolemaida, Thessaloniki, Parta and Kalamata have embraced her heartily. 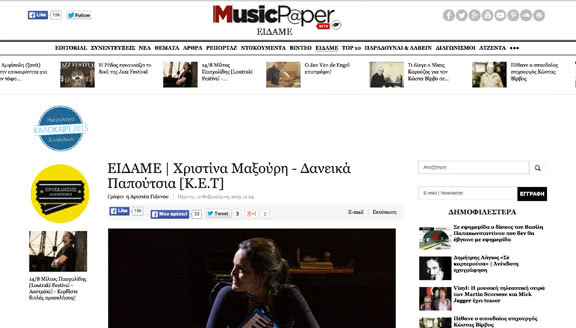 Two performances follow at KET in Athens on the 29th of January and on the 5th of February. And afterwards she hits the road again… Giannena, Lefkada… And then, we have lift off! London awaits her on the 10th of February for a single live performance at SOAS University, while two weeks later Paris follows at Maison d’ Europe et d’ Orient. “Borrowed shoes” can be addressed to one person and can be addressed to five hundred. The base of the performance is the songs. For me every time this is something else, because it is in a different space with a different audience. And the more unknown these are, the bigger the challenge for me” she confesses to me. I ask her what emotions are brought on by this experience. “It is a little as if I am opening up my house, and people come in my room” she answers with a smile. “What you gain through a cappella is the closeness and of course a great margin of error is allowed. And when I say error, I mean the freedom to act out of context, without a strict musical sheet. Our only musical sheet here is the succession of songs. What I have defined as beginning, middle and end and what is defined in collaboration with the audience itself.” Songs by Hadjidakis, Theodorakis, Loizos, Spanos, a part of an aria by Bizet, an old Mexican song, several rebetika, two or three traditional songs, even a song by Karvelas, the monumental “Sose me”, come together with some excerpts in between, excerpts from Hamlet, Golfo, Abelard and Eloise, some texts by Hadjidakis and Leivadits… All of these together make a magical mural, with Christina stirring memories and emotions. At times only with her voice and at times with a glockenspiel or a harmonica which she plays. “On one hand it is a very personal project and on the other it is a mural by everyone. It has to do with my childhood memories, with experiences I had later in theatre, with people I met and have stolen some of their light… It is also a way to thank some people, which I have appreciated, appreciate now and will appreciate in the future. It is a way to say thank you to my friends and family. Singing works that way to a great degree anyway. It helps you share things you think and feel with more distant or closer people” Christina notices. Being a great and talented actress with a really wonderful voice, I ask her what she really believes is in the power of singing. “The fusion”, she points out. “Songs usually have a text which is already known. When we go to the theatre, unless we already know the play, we don’t know what we will hear. With singing it is as if there is a common ground. We all go in the same room. But, the way that everyone does, is something very personal”. «How did the idea of “Borrowed shoes” come about?” I wonder. “I was getting in the metro and the train and saw a lot of people very isolated. As if I could see only figures and not people. We didn’t look each other in the eye. There was no kind of communication. And I thought to myself, what is happening? Something is not right. I felt like I wanted to start singing to get something moving, for an energy to exist, to crack a smile…” she confides in me. Her appearance in a friend’s live session in Harvest was how a proposal came about by the owner of the bar for her to do her own session there. “She proposed I did something of my own there. I hesitated at first and she told me “why not?” That question, “why not?” is what caused tenths of questions in my mind and a hundred pictures. And so that suspicion brought on very quickly a series of songs and emotions, which I decided to share with the world”, Christina explained. “How did you build up the courage for a tour?” I ask her, knowing well that organizing of a tour requires a whole support mechanism behind it. “I invented the mechanism” she tells me and starts laughing. “Look, I mainly move based on desire. Sometimes also on impulse. And of course common sense. I asked some people who either live where I wanted to have a live session or had worked there as musicians and then I started making calls. I started from zero. That is a strange procedure, because basically nobody knows you. Not that it means anything. It is just a bit strange to have to talk about yourself. To promote yourself. I don’t have someone to manage me, which I don’t know if is good or bad.” If in her first live session in Athens Christina got strength from her friends, who all came to enjoy her, in the District it was completely different since there were strangers in the audience. “And that proved once more how much strength songs have. The goal is the songs not the person. The desired result is not for them to know you. The desired result is the atmosphere that will be created in those two hours. The goal is to speak through the songs. The more guilt-free this occurs,the more you are rid of the stress to win the audience, the better. My only concern in all this is to not seem fake”, she comments. And so, she gets ready to share the stage in some of her upcoming live sessions with some of her good friends. On January, 29 in KET Matoula Zamani will be her guest, and on February, 5 Maria Papageorgiou. And the journey continues… Don’t miss it! It’s a unique experience. Christina Maxouri (Television Control Center) 20/12/2013 www.musicpaper.gr There’s this American phrase, which I personally hate, but for the first time I find it very fitting for the use I am going to make of it. Christina Maxouri “puts us in her shoes” in her (based on emotion, but also very difficult) performance, at the “Television Control Center”… The actress and great performer won not only the applause, but also the hearts of the audience, who attended KET in Kipseli, on Thursday the 19th of December. In a two-hour program of her…almost solo performance, Christina Maxouri placed us within her very personal, artistic world, took us on a walk through the “alleys” of sorrows and joy, and in the end she gave us whole-heartedly an early Christmas present, a breath of soul in the middle of a very difficult (in all aspects) winter. With impressive extroversion (but not self-centered and with no trace of arrogance) she “revealed” herself, opened up to us and also mocked herself, the link being a natural sense of humor, springing from an inner politeness of her character and not from an acquired technique. Of course, it is of assistance that she is an important actress, one of those who – luckily – continues to offer her talent to the Greek theatre, but how can one not note the level of difficulty, which she actually faces in a “confrontation” with the audience “head on” and with “no hidden cards”. On a flat stage which doesn’t offer any safety nets, only a breath away? That takes guts and soul. Christina Maxouri sang a cappella, she played the glockenspiel and the clarinet, with such energy, that even the mistakes seemed to be part of the performance, a continuous and sincere conversation with the audience, which was whole-heartedly joyous for living a metaphysical experience, since on one hand Maxouri laid out an atmosphere of familiarity and at the same time in front of your eyes you saw moments of the recent and distant past, the communal or the individual for each one. Depending on how each one confronted their memories. Songs of classical rebetiko, by Markos and Tsitsanis, where heard, as well as some from the period of the archontorebetiko, before we strolled down to the era of contemporary music, starting from the master, Manos Hadjidakis. The thing is that in this abundance, the “hostess” is also judged by the level, the detail of her criteria, because she suggested a selection very carefully structured when it comes to the genre as well as the power of storytelling. Besides, this is more than anything what she accomplished. To tell a lovely story with a strong personal element, where what was “hers”, became “ours”. From a “rhythmic”, more “rap” version of “Margoudi and Alexandris”, to unexpected ones from Hadjidakis, with lyrics by Christianopoulos and Kambanellis. Yes, Foivos Delivorias was also there. With a discrete presence, but very essential. He came for the second part and respectfully joined Christina Maxouri (the moment we heard Holly Mary’s lament was very important), with songs like those of Zabetas, as well as more unexpected ones like “Pera stous pera kambous”, which he revealed was the first song he remembered as a child, while in the encore, he gave us an unreleased version on his new song “Bastardos Yios”. By Sotiris Bekas P.S. 1 Christina Maxouri worked really hard for this performance and you could see that. Even on the break she took on the role of hostess and bartender (!) and whilst she was inside the bar, she continued her performance with a piece of prose. P.S. 2 The KET is a very friendly space towards the artist as well as the audience. P.S. 3 Christina Maxouri completes this mini cycle of performances on Sunday 22 December, and this time she welcomes Nikos Xidakis. 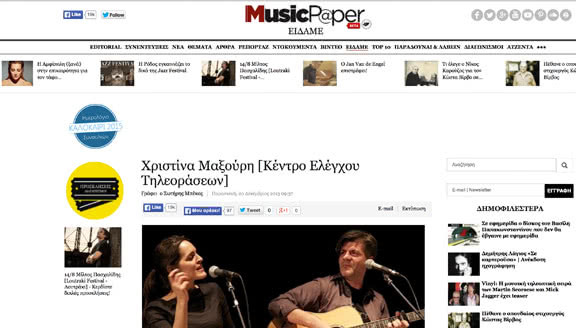 INFO Borrowed Shoes/Christina Maxouri a cappella at KET, Sunday 22/12, guest Nikos Xidakis. Time: 21.00 Entrance fee: 6 Euros. Duration: 2 hours. Artspace “Television Control Centre”, Kiprou 91A & Sikinou 35A, Kipseli.